Development of the Web-site “a Wedding in Mauritius” for our Mauritius client included a Word Press template optimization, logo and favicon design, photos processing and publishing, pages, galleries and posts creation and SEO. We partially translated the client’s texts into Russian, wrote new texts for the articles, SEO optimized the client’s texts in Russian, set up tags and provided keyword placement according to the list of approved queries. Website was submitted for indexing to Yandex and Google and has been was indexed fast and smoothly due to sitemap.xml and a robots.txt file, which meet all the requirements of the search engines. Web analitics have been set with Webmaster.Yandex and Yandex Metrika, as well as Google Analytics. 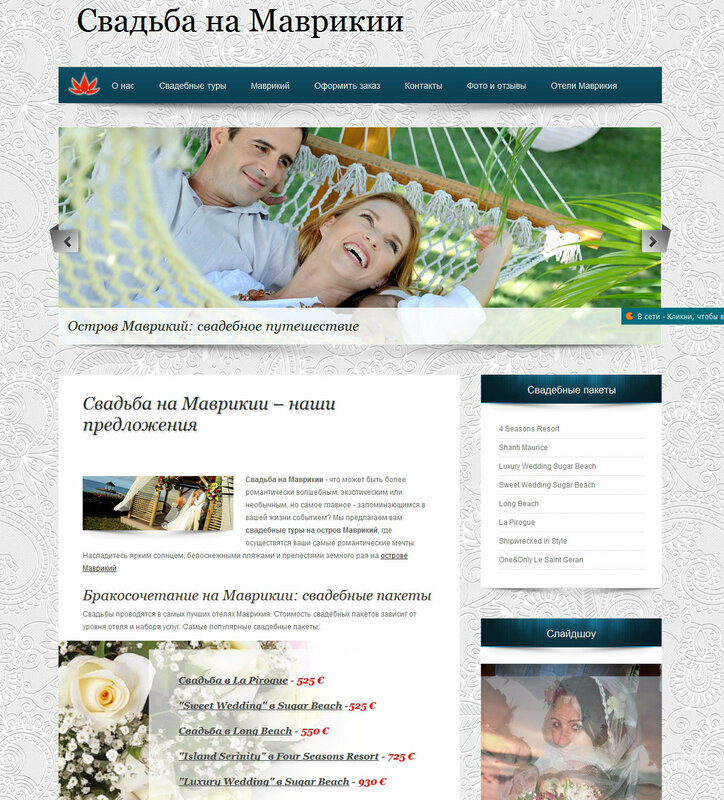 Official pages of the wedding operator are created in social networks (Facebook, Twitter, VK.com). We provided initial off-page optimization with backlinks building (no more than 100 per month) and articles writing. Seograd.com provides the website with technical support, updates and regular SEO.